This is what put me behind a little in my aquaponics project. After filling the grow beds with gravel (and not even to their limit) after a couple of hours of strain the bolts I had put through the wood snapped and tilted the benches. That put the project back a few weeks given a number of factors such as emptying the beds, weather, organising to get steel legs welded (and picking up the welder) and of course work commitments. So, last weekend I had a helping hand from my FIL to weld two steel legs onto the corners that had wooden ones and we added extra support with timber beams wherever I could get them without making too much of a complicated structure. The other issue I had was that the pipes I had drilled holes into actually allowed the water to drain out too quickly. So I cut more and replaced them. The pipes with holes are to be used for marron houses. 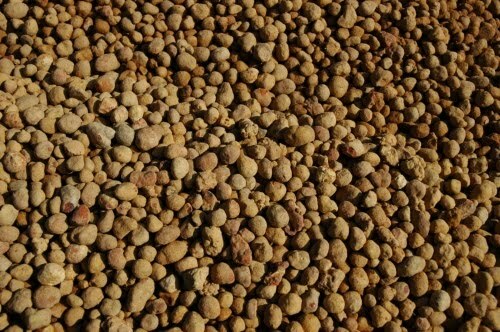 Here is a close up of the pea gravel I ended up using instead of expanded clay. The finished set-up used a trailer and a half of pea gravel (around 1 1/2 cubic metres) and cost $130 instead of the $1000 plus it would have cost for expanded clay. It was also heartening to see the odd seed that had found its way into the gravel at the landscaping yard and had started to grow. Here is the helping hand getting into it. My father-in-law has become quite enthused about the set-up and potential of this project. You can see the welding rods in the foreground. Dad’s cutting steel for the smaller leg in the far corner. I had to make doubly sure that the benches were going to take the weight well. Not only was the gravel weighing heavy, but the water was still to flow into the system and the weight of the plants would also add to the over-all burden. And here is the result of a couple of days work putting the plumbing in and the gravel. 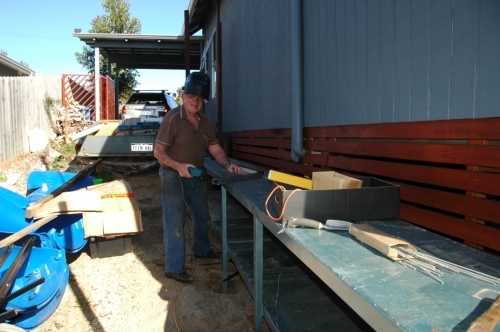 We also got a new bed over the weekend and while taking the old, rattly metal frame apart from the old bed I discovered that I could use the frames for support in the system. So there they are, standing a couple of grow beds apart ready for tomatoes, or peas or beans or whatever else might need some support. Oooohhhh, cucumbers! The pump arrived yesterday (Wednesday) so today was the day to set that up. The box looked quite small when I picked it up from the post office. Inside was a smaller box still and when I opened that I found the pump tucked in with foam, making the pump smaller still! Here is another pic taken yesterday before much of the plumbing had been fixed in place and after my brother had given me a hand bucketing the gravel into the grow beds. 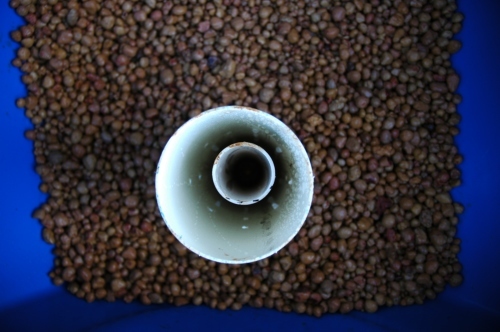 There is enough pressure in the pump to get water entering the grow beds. I did a test run and found that the beds emptied much to quick in comparison to the speed that water was entering and so they were not filling and the 90mm drainage pipe was overflowing. I had drilled two holes in the bottom of the standpipes for each bed and I filled in one of these to assist with a slower drainage time. 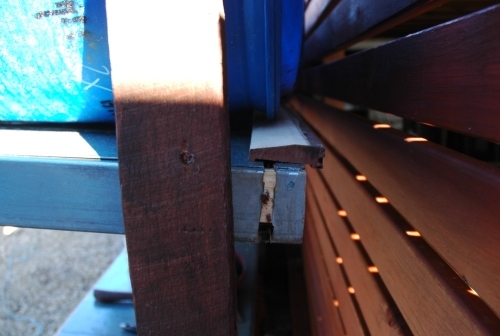 Then I drilled more holes into the polypipe that transports the water to the grow beds. I’m waiting for the sealer to dry now before I give it another test. I have also piped together the two fish tanks with a tap incorporated into it so I can isolate the tanks if need be. The primary job of this piping is to equalise the water levels between the two tanks whilst water is being pumped out of the front tank and then to equalise again once water starts to flow back into the tank. In this way I can also keep two varieties of fish ie. goldfish in one and silver perch in another. Plus with the number and volume of grow beds I can easily accommodate two tanks. 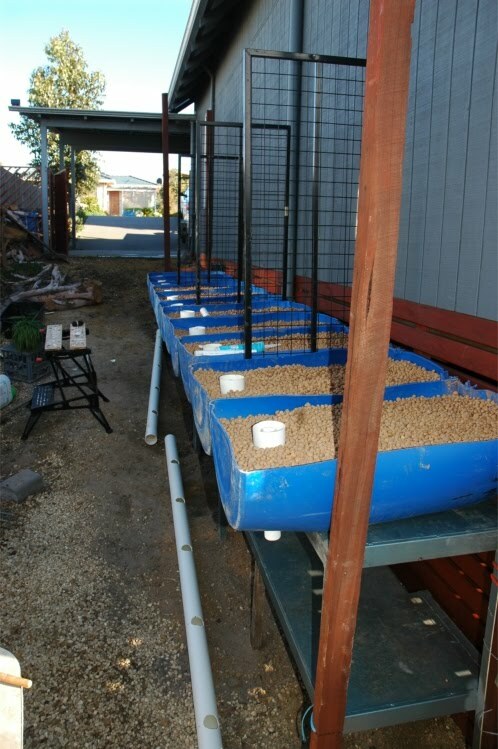 I designed the system so that, as suggested, there is more grow bed volume than tank water volume in order to allow the water to be properly filtered by the plants and microbes. I also had set it up so that each grow bed can have different plants at different stages and still support the system, even if at 50 % capacity. The other advantage of having numerous beds is that I can experiment with different techniques for each and compare the results. The finished design is even simpler than my drawings and workings. Wherever possible I have made the pipes the shortest length possible to allow easy flowing of water both to the grow beds (reducing friction for the pumped water) and from the beds in the drainage pipes. I noticed that the water drained much better if allowed to fall into the fish tank rather than having a longer pipe submersed in the water which created a lot more friction and resistance. The next thing is to move the goldfish and let the pump run for a bit to wash out the remaining gravel dust. Then I’ll let the water be still to settle the dust and then vacuum it out from the bottom of the tank. 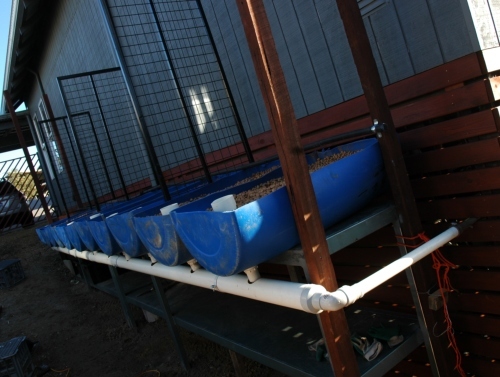 I am thinking of using Redfin Perch initially in the front tank and goldfish and marron in the second. 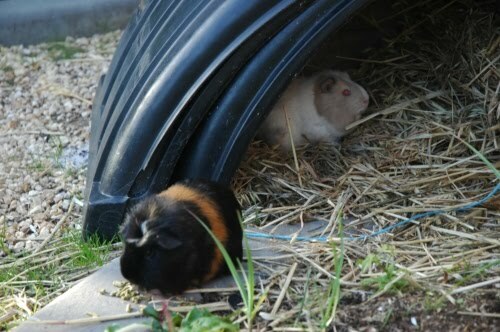 And at the rate Maiki and Jazz are eating stuff at the moment I’m sure they will be pleased to have copious quantities of parsley to munch on. It should keep them away from the broad beans at least. I think the chooks will appreciate the extra spinach too.